For many years, Brent oil (a European grade) and West Texas Intermediate (WTI) oil, a US grade, sold at close to the same price. Starting in January 2011, WTI price dropped below Brent, at times by more than 20%. When the price of WTI dropped, the prices of quite a few other grades of oil (especially in the Midwest, but perhaps elsewhere) were affected as well. To get an idea of how much the overall impact was, I compared the price refiners pay for oil to that of Brent and WTI (Figure 1). Figure 1. 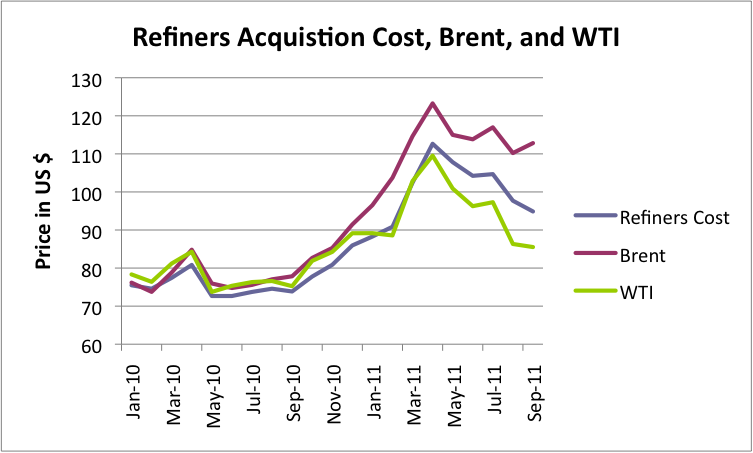 Average refiners acquisition cost, Brent oil price, and WTI oil price, based on EIA data. I found that the drop in the prices refiners pay for crude oil prices is much more akin to the drop a person would expect if 40% of crude were affected, than the small drop one would expect if only WTI itself were affected. 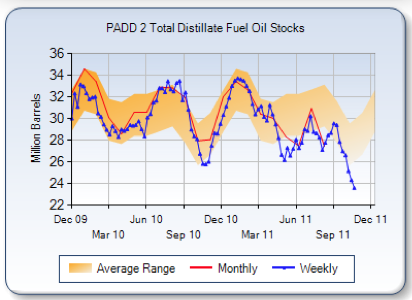 The price change during 2011 did not seem to be due to changes in average viscosity or in sulfur content either. Some of the types of crude that have been hit by lower prices are those from the Alberta. Recently, there have been proposals by Canadian companies to try to fix the problem. Enbridge announced that it is buying a 50% stake in the Seaway pipeline, and will reverse its direction, so that it will carry crude oil southward, from Cushing to the Gulf, instead of northward, as soon as the second quarter of 2012. In addition, TransCanada has announced the it wants to build the segment of the Keystone XL pipeline from Cushing to the Gulf, possibly starting as soon as January 2012. The question now is what impact the proposed pipelines will have. Will they even out the Brent/WTI price disparity, and, at the same time, cause the prices of other crudes, such as Canadian and Bakken crudes, to rise as well? Or will the pipeline adjustments fix only part of the problem, and add new problems at the same time? In my view, the latter seems more likely, for reasons I discuss in this post. For those who are interested, I wrote a post in February giving more background, which can be found here. Neither Brent nor WTI itself represents more than a tiny fraction of the world’s oil supply. One question that has been raised is, “Is the Brent price high, or is WTI price low, or is it a combination?” To look at this, I compared both prices to the world average oil price, as calculated by the US Energy Information Administration, found here or here. Figure 2. 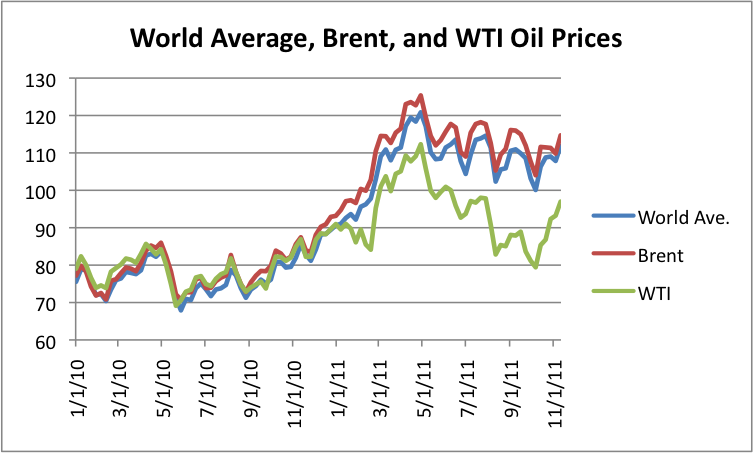 Comparison of WTI, Brent, and world average oil prices, based on EIA data. The answer seems to be primarily that WTI has fallen relative to world oil prices. Figure 2 shows that during 2010, both WTI and Brent prices tended to be a little higher than the world average oil price. Starting shortly after the beginning of 2011, Brent rose about 1.5% relative to world oil price–while WTI dropped below the world average oil price. The amount by which WTI declined varies by month relative to the world average oil price. For the period graphed, WTI has averaged 14.3% (or $15.75) lower than would be expected during 2011, based on the average world old prices during 2011, and the 2010 relativity to average world oil price. To see if the lower WTI prices were actually translating to lower prices for refiners, I compared “refiners acquisition cost” to Brent and WTI oil prices, as shown in Figure 3. My conclusion was that refiners acquisition costs in 2011 have been significantly lower than expected based on 2010 relationships–far lower than if the price adjustment related only to the 3% or so of oil that is actually WTI. The amount of the difference between the actual average refiners cost and the expected average costs varies by month, averaging about $6 lower for the 9 month period, meaning that the average refiners cost of $100 during January to September, might have been $6 higher (or 14 cents a gallon higher), without the recent pricing shift. I checked to see if average viscosity or sulfur content was changing in a way that might explain this change, and it was not (even though we are importing somewhat more crude from Canada). Figure 4. 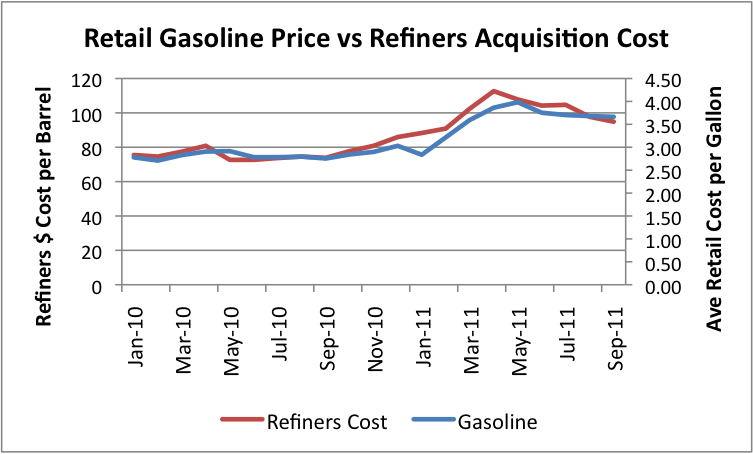 Relationship between average retail gasoline price and refiners acquisition costs, based on EIA data. Another way of looking at this is in terms of relativities to January 2010 prices, as shown in Figure 5. Figure 5. 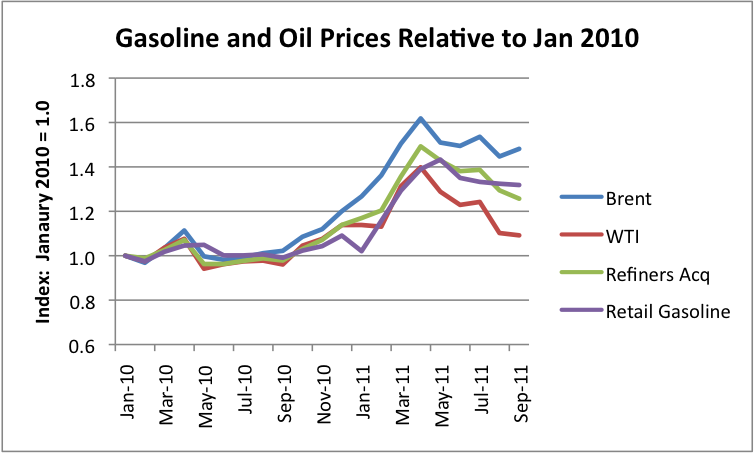 Gasoline and Oil Prices Relative to January 2010, based on EIA data. My conclusion from Figures 4 and 5 is that savings in refiners acquisition cost have (more or less) been passed through to customers. This is too rough a comparison to say anything very precise, but suggests that high refining margins that have been reported in the Midwest are being balanced out by lower margins elsewhere. Refiners are selling about 510 million barrels a month of finished products in the US, so the savings of $6 barrel would amount to savings of $3 billion a month or $36 billion a year. The savings to consumers would be about 14 cents a gallon, if these cost-savings are passed on to consumers. This difference may not be enough to keep the US out of recession, but it provides at least a small benefit, relative to paying full world oil prices. The United States’ refiners’ relatively low-cost structure in 2011 may also help explain why the US has become a net exporter of petroleum products this year, as shown in Figure 6. I was surprised to discover that the United States now even exports gasoline. In recent years, we have imported gasoline from Europe and elsewhere. Our recent shift from importing to exporting oil products tends to help our balance of trade problem. One reason that we export petroleum products is because the amount of petroleum products the US makes (including blended-in ethanol) continues to rise each year, as shown in Figure 7, while our own consumption has leveled off or is declining. Will reversing a pipeline from Cushing to the Gulf fix the WTI/Brent differential? It is not clear to me that either or both of the proposed pipeline changes (Seaway reversal and new Keystone XL segment to the Gulf) will fix the refining problems currently being encountered. One issue is that the Gulf Coast refineries are almost as full right now as the Midwest refineries. For the year 2010, the average refinery utilization percentage for the Gulf Coast (PADD 3) was 88.6%, compared to that of Midwest (PADD 2), at 88.7%. For 2011 through August, the Gulf Coast is averaging 88.3%, while the Midwest is averaging 90.4%. (2) The Midwest and Gulf Coasts seem to have a disproportionate share of ”complex” refineries that can handle heavy, sour crude, and these types of refineries seem to be more in demand. Since Gulf Coast refineries are already close to maximum capacity, it is not clear that bringing oil from the North will add much to the quantity of oil being refined by the US. It would seem as thought the new southbound pipeline capacity may lead to a new pricing conflict–between the oil coming from the North, and the oil that was previously being refined on the Gulf Coast. Oil from the North, including oil from Canada, will need to compete head to head for refinery space along the Gulf. In such a case, it seems to me that the world will have closer to a level playing field with respect to refineries competing for crude oil. Some oil will be diverted elsewhere with more capacity, such as the East Coast or the Far East. Oil prices will tend to even out, so American refiners will pay more, and will likely raise their prices of refined products, because of this. These higher prices will reduce the quantity of oil Americans will buy, and may even cause recessionary influences. These higher prices may also cause our refined products to be less competitive in the world market, reducing quantities sold and putting pressure on “crack” margins. At this point, we don’t really know if there is adequate world capacity for rising production of heavy-sour oil, because lack of southbound pipeline capacity from Cushing has kept the increased amount of non-upgraded crude oil from Canada from the world refinery market. (See Figure 8 for recent “complex” capacity by ENI.) If there is inadequate complex refinery capacity worldwide, it will become apparent through a rising world-wide differential between heavy-sour and light-sweet crude price. If this differential should widen, the Canadian producers may not get the benefit they are hoping from the southbound pipelines, even though the WTI/Brent spread may drop to near zero. Over time, one might expect additional Canadian crude to flow south, with the benefit of the new southbound pipeline capacity. The one benefit of additional Canadian oil, even if it only displaces crude from other sources, is that it is likely to be a longer-term stable source of supply than some other sources of imported oil, such as Mexico, whose oil is rapidly declining, and Venezuela, which is forming ties with China. Of course, Canada is itself an oil importer on its East Coast. If it loses those imports, it may have more need for oil from Alberta itself. Would a pipeline change help or hurt diesel fuel supply? When we look at recent EIA graphs, we see rapidly dropping stocks of distillate fuel (which is used for diesel and home heating), shown in Figure 9, below. Figure 9. 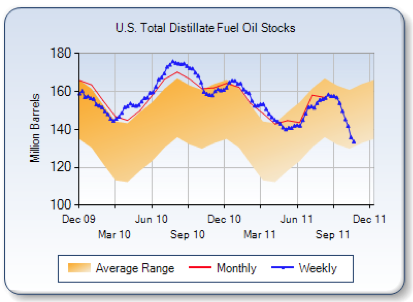 EIA graph showing Total Distillate Fuel Stocks (Diesel + Heating Oil), as of November 16, 2011. The problem is especially severe in PADD 2 (Midwest), shown in Figure 10. We also read stories about diesel shortages in North Dakota (in the Midwest), such as: Diesel fuel shortage is one of worst. Somehow, it seems a little ironic that we are talking about turning around pipelines to send more oil south to the Gulf Coast, when oil product shortages are occurring in the Midwest. When we turn around pipelines, we may, for a time, end up operating Midwest oil refineries at a lower percentage of capacity, adding to our lack of distillate in the Midwest, unless more refined oil products are sent back to the Midwest after they are created elsewhere. The issue here would seem to be at least partly price. What the US is doing is making a lot of distillate fuel, and exporting a growing share of it. What we really need is higher US distillate fuel prices, if we are to compete in the world distillate market. If US refined product prices are higher as a result of the pipeline change, it should help this problem, but as noted above, higher prices for the consumer are not without difficulty–they can lead to declining purchases and even push the economy toward recession. This article originally appeared on Our Finite World. We're losing capacity here in the north east. Sunoco just announced the shutdown of the Marcus Hook refinery starting TODAY. The big Philadelphia Sunoco refinery is scheduled to shutdown next year. 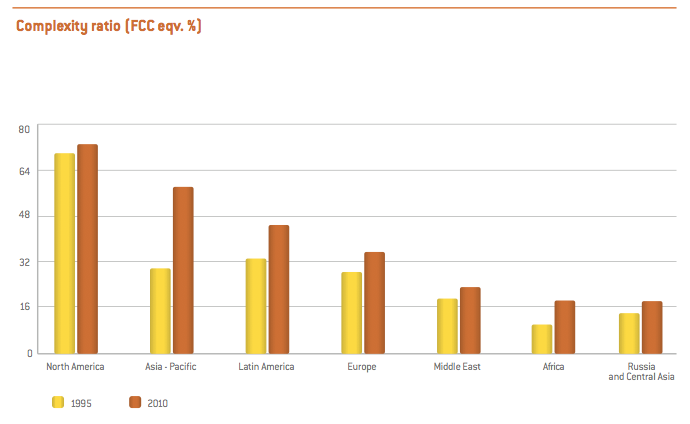 This will chop off about 700,000brl/day of refinery demand by next summer (2012). The Philadelphia refinery is a full conversion type, capable of manufacturing all petroleum products from sour crude. Consumption is down in the Northeast, and I think they have less in the way of specialized refineries. Also, the Northeast would tend to get more oil from the North Sea, and it is declining in quantity. Worldwide, you would think that there would be excess capacity, especially of the "simple" refinery type, that works OK on light-sweet oil, but not on the heavier oils. All of these things would seem to affect the North East. Mexico has not been able to add the kind of refinery capacity it needs. When it sends oil North, it tends to go to the Gulf Coast, where the capacity is available of the type that is needed. Wouldn't higher prices for N Dakota oil provide income for producers there? If that revenue is spent in the US that would counterbalance any recessionary effect of higher end-product prices. Also, wouldn't it create more incentive for drilling/production in the US? I think to a significant extent we are dealing with a 99% / 1% problem. There are people who get rich from oil in North Dakota, but they are disproportionately concentrated in the 1% that already has as much to spend as they need. I think, though, that to some extent you are right. The "center" part of the country (Midwest, Gulf Coast, and Rocky Mountains) is definitely doing better financially than either of the coasts, and oil consumption in higher in those areas. That is part of the reason for the shortfall in diesel in North Dakota--hard to get enough supply to where it is needed. The US's production is indeed up recently, and there is interest in doing more drilling. Looks like a self-fulfilling prophecy - would there be a shortage if everyone hadn't stocked up?? Paul - I suppose the critical question is has anyone seen reports of operations being suspended for lack of diesel. If not then it's just a matter of accounting as you suggest. Well, in Alberta, there are actual reports of slowdowns of operations from fuel shortages. There was an explosion at an SK refinery that has shut in production there, and some other issues at Suncor;s Edmonton refinery. So, I guess we can say there is some truth to the shortages story. In Alberta there actually is a chronic shortage of diesel fuel - much of it caused by the oil industry using so much diesel. (It's the good old EROEI concept in action). There is help on the way - the Alberta government is subsidizing the construction of an oil sands refinery that will upgrade bitumen direct to diesel fuel with a 50% diesel cut. However, the startup of phase 1 will be toward the end of 2014, so it will be a long wait. The Alberta government is committing its take-in-kind royalty bitumen to this project, which means after payout, it is going to be producing an awful lot of diesel fuel. The royalty rates on oil sands are 2% before payout (i.e. before the capital costs of building a project have been paid for) and 25% after payout. As the resource owner, the Government of Alberta is entitled to take its royalty share of bitumen production in kind, as it does currently for conventional oil production. The Government’s bitumen royalty volumes will be a significant and growing source of reliable hydrocarbon feedstock into the future. The Government will consider having a portion of its bitumen royalty in-kind volumes commercially upgraded to higher value products in the province. As demand increases quicker than expected, the market is still facing the results of a prolonged decline in forward drilling. For each month the price of crude oil declined from August 2008 through the first three quarters of 2009, followed by a sluggish level into 2010, we lost about two and a half months of forward drilling volume. That translates into us being more than two years behind when the demand (and the pricing) began accelerating. That "production deficit bubble" moving through the system has now intensified the impact of that added demand. His logic wasn't very good: big oil companies don't seem to pay much attention to spot prices when making drilling decisions. That's good when they dip below the long-term trend, and annoying when they spike. There are really multiple issues with respect high oil price. If there is not enough oil to satisfy demand at a given price, say $50 barrel, the general direction of the price is up. But high oil prices tend to be recessionary. Governments know this, (or at least figure out that they are on the edge of recession, and spend money that they don't really have on everything from stimulus to bailing out banks to unemployment insurance. Their revenue is also down, so governments encounter problems in that way also. The question is which problem area predominates. At this point, we have huge amount of government problems around the world, including the debt problem in the United States. If a large number of government workers are laid off, and taxes are raised, this will translate to a recession, and oil prices will drop. If governments can hang on, and stimulus actually works, then oil prices will rise. My guess is that we will be hitting more government problems around the world (perhaps Europe and the Euro next) and oil prices will drop. I wanted to thank all the posters and commentators on The Oil Drum system for being citizen journalists. As such you are one of the "professions" that makes America great. These price fluctuations really have an impact on the 100 million Americans living on the economic edge, so thanks again for your research and reporting.